There's a quick way to get to Las Vegas from San Diego and that's up Interstate 15, through Barstow and Baker and then the desert drive through Primm. It's not very scenic but it is quick. I decided to go the back way to Las Vegas, through Ramona and from there over the mountain to Palm Springs. 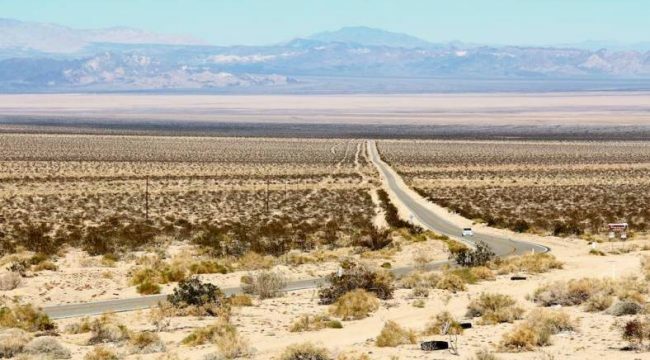 From there, Highway 62 heads east through Yucca Valley, Joshua Tree and Twenty-nine Palms, by way of the Mojave Desert to Parker. From Palm Springs, Highway 62 passes through Yucca Valley, a small desert town, with retirees, military personnel, and service workers. There's not a lot to see in the small towns, the motels, gas stations and the general store are on the main drag, and all the residents live away from the highway out in the open desert. After the last little town of Twenty-nine Palms, we searched out the junction for Amboy Road which took us north into the desert. Amboy Road north is a pleasant two lane highway with side roads going off into the waist high brush. in this stretch of road we see mostly desert dandelions and mules ears, with occasional patches of wild oats and other grasses. the road eases over two little passes, really just divides between two dry lakes. In the second there are salt mines and operations recovering minerals from the lake bed but beyond that there's not too much to see in the way of mankind's things in this first stretch of highway. Amboy Junction marked our arrival at the historic Route 66 . We took a stretch here, looked at the service station, took a few pictures and hit the road. 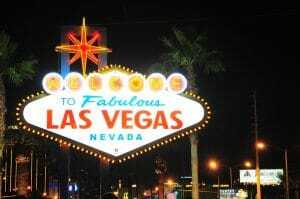 We planned to spend our first night at Laughlin and then proceed north to Las Vegas. The next piece of highway, one of the last long stretches of highways 66, all too soon joined Interstate 40. Our next junction was Highway 95 n where we passed through Searchlight. It was a welcome relief from the long stretches of desert. At this point we were starting to see the beginning of Las Vegas traffic. Lake Mead. There are a number of pullouts and viewpoints along the 60 miles of highway from near the dam to the Virgin River arm of the Lake. Near the north end of the recreation area is Nevada's State Park Valley of the fire, on State Route 40. This park stands out as a wonderful geological textbook of erosion by wind and water. The rocks and formations seemed almost alive with the changing shadows. The park is open year-round 24 hours a day so it's possible to go in early in the morning or late in the afternoon or at midnight to enjoy the spectacular scenery and the clean desert air. Camping is also available though I would recommend at least an RV. During my visit I found it hard to choose between the shots that were available as every turn in the road opened another inviting vista. I like to get off the beaten path as you can tell, and Las Vegas was no exception. Highway 95 was the original road after Hoover dam was built and before Interstate 15 came through. So there are a lot of older hotels with the old style of neon signs. Las Vegas' unfashionable downtown has almost completely disappeared and seems that the redevelopment will eliminate the last of old downtown. We had a great time at the Palace Station in Las Vegas, the big comfy beds, lots of iced drinks and a great view from the 16th floor looking towards the Stratosphere Tower. I did some shopping, took a look at the monorail stations, and played slots a little bit just to say that I had.